Now that the entire list of the new Duel Decks: Phyrexia vs The Coalition has been released (here and here), it’s a good time to take a look and see what goodies it holds for EDH. Yadda, yadda, yadda. Why should we care? I mean, it’s not like the put anything good in those decks anyway. It’s just for noobs, right? Wrong! Not only is it good for getting old cards in the new frames (which can help with the “pimp” factor), it also helps if you weren’t playing much in those days. Yes, Urza’s Saga and Invasion were over 10 years ago. Yes, that makes me old. Let’s see what each deck has to offer for EDH. Now, while these decks are meant to be played together against each other, not all of the time will you keep them together. There might be a good portion of you who do, and that’s great, we’re here to see what would happen if you tear it apart and add or create to your EDH decks. A chance to buy 4 Generals, some awesome never before printed cards in new frames, and to get your hands on a couple new foils, might be worth the $20 MSRP (hint: yes it will be). We will look at the Coalition’s deck which was first chosen randomly in alphabetical order. This is mostly a 5 color Green deck with Black splashes. 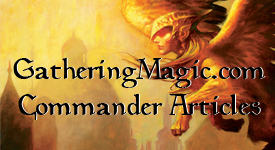 There’s some great things for mostly all decks, but certainly for multi-color EDH decks. Sadly, the Invasion tap lands have been outclassed several times (Coldsnap tap lands, Shards of Alara tri-lands, the M10 Duels and the new Worldwake duel manlands). In EDH, it’s never bad to double up on effects with different names, so these will always see play or if you’re on a budget, they’re great. Terramorphic Expanse will always be a good card in decks with 1 or 2 colors and I hope will never be out of print. Three, (yes three!) of the Invasion Dragons being reprinted? While all could’ve benefited from Painter’s Servant not being banned, what are you going to do. Each of them are Green based and two of them (Rith and Treva) could benefit from token generation (Avenger of Zendikar perhaps) to really increase their awesome abilities. Darigazz can easily fit with Karrthus, Tyrant of Jund (damage from Darigaaz’s ability does not count as General Damage) and deciding between the two as a General might be tough. Rith is seeing a third printing (after From the Vault: Dragons) so if you missed out there, it’s going to be here (attach a Armadillo Cloak for even more fun, even the pros did it). Teva gives Bant decks another option, not that they needed another good General. As for Gerrard, he might not get the same love as the dragons. EDH players might be disappointed in such Weatherlight crew such as Captain Sissy not being reprinted, but Gerrard might bring back some mono-White control EDH decks. Each turn you can target a different opponent and work with Cradle of Vitality to make any creature you want huge. Nomadic and Quirion both help filter mana once in play, and should not be included in Mono-Green decks (no need). Nomadic can see play with Onmath, just not with Onmath as General. Yavimaya Elder is always a welcome sight in decks as helps ramp mana and does work with landfall effects pretty nicely. Plus, new art and new frame, can’t go wrong with that. All three battlemages have nice kickers for their respective colors. If you note, each one of the battlemages fits into a certain wedge (Bant, Naya, Jund); the same wedge as each of the three dragons. Coincidence? I think not. All of them have EDH relevant abilities when kicked. Yes, not only do you get to be like Brian Kibler and play Rith, but also get to use Armadillo Cloak as well. New art does help, but there will always be a foil Invasion and FNM version for you to pimp out your deck. If you’ve never got one, then this is your chance (Please note: it doesn’t say lifelink, there’s a reason for that). Likewise, if you have never played with Coalition Relic, now’s your chance. Don’t dismiss it at first as saying it’s weak. Give it a few times and see how powerful it really is. Where’s Fertile Ground on this list? It’s been reprinted 20 times; if you don’t have one, ask a friend. Yes, the Charms match up with with Dragons once again, but Rith’s is the only one that seems reasonable for EDH land (Treva’s is borderline). Harrow’s was reprinted in Zendikar and most of the other spells are Domain-based which if you’re looking for those kind of spells, here you go; but they don’t go well in less than 5 colors. The only other spell worth mentioning is Urza’s Rage, which is foil and has new art. Tell that annoying Blue mage to shove it as you deal 3 or 10 damage to him, uncounterable (or if kicked, unpreventable). A mono-black deck that’s all about sacrificing. It should be noted that a majority of these creatures would work well with Grave Pact or Butcher of Malakir. No mono-Black Generals or non-basic lands here, but there are some interesting cards that are being reprinted that you will see in EDH decks soon. Would’ve love to seen Urborg in here, but can’t have ’em all. Ah, ways to get your guys into the graveyard from play. Again, with effects like Grave Pact and the Butcher, these are pretty much auto include in those types of decks. Of course, the real beneficiary of these cards is a Savra, Queen of the Golgari EDH deck. Her ability works on sacrifice effects, which is what all of these cards can do. Don’t mess around with the Plaguelord, it’s big enough to take down a lot of Generals. Bone Shredder costs less than Nekrataal and can be sacrificed to the others abilities. I used to have that in my Ichorid deck before, you know, dredge. Colossus gets the awesome old art in the new frames, and with a handy artifact that’s included in here, can be untapped for free. Though paying 1/5 of your life to swing again or untap at any time might be good (especially in a mono-White deck). The Negator brings a possible 5/5 trampler on the first turn (new art, and foil). Just watch out for those Red decks. And Priest has his old errata back: Flicker him or bring him back from the graveyard does produce mana. Both of these are General friendly equipments (gives it shroud) and have seen, and will continue to see play in EDH. If you didn’t get it in Mirrodin, or didn’t get a chance with FNM, here’s your opportunity to get Greaves. Arena is very nice, you’ve got 40 life to play with and it makes even the players who treat every life like it’s their last want to play it. Processor’s the same way only (once again), will it really shine in mono-White decks or Black decks that drain life. Voltaic Key gets new art in a new frame, and if you don’t want it, trade it to Vintage players. ‘Course, it’s only ok with Colossus, Processor, Powerstone, and almost every other artifact. Powerstone, while not Sol Ring, still accelerates mana. Printing Dark Ritual again is like saying “Hey, we know this is a format warping card, so we’ll print it in everything besides sets.” Yes, it works in this Duel Decks, and it’s new border, but nothing to throw a parade for. Living Death, on the other hand, you might as well do that. Living Death changes board position instantly. With “enters the Battlefield” effects that trigger, this is going to be one of the more powerful spells you can ever play in EDH. Yes, you build your deck around this card, it’s that good. In all, both of these decks are pretty good for EDH players. If you’re shelling out MSRP of $20, you’re getting your money’s worth. 33 of these cards are EDH playable and for $20 (less than a dollar a card), really worth your time. If you haven’t been playing long enough to have gotten a majority of these cards, do so. This is a recommended buy. Goes on sale March 19th. This entry was posted on Wednesday, February 24th, 2010 at 12:18 pm	and posted in EDH, Magic: the Gathering. You can follow any responses to this entry through the RSS 2.0 feed. I love the duel decks. A great value for the MSRP. This series in particular have a load of good edh card, not to mention a few generals for those looking for more legends. Also its just fun to play the two decks. They are pretty mana heavy so games can be quite swingy, and it really feels like the player on the draw is at a giant disadvantage. 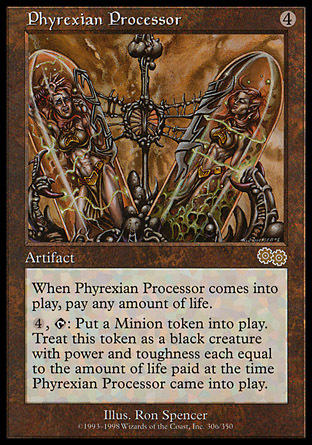 Turn 1 Dark Rit into Priest of Gix, into Phyrexian Arena (or Negator) is pretty much game over as the Coalition has little in the way of early threats.